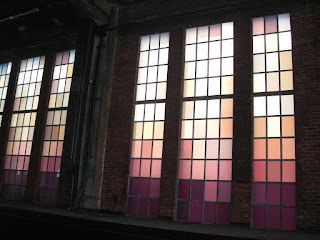 This is a small portion of Spencer Finch's The River That Flows Both Ways, 700 panes of colored glass installed in existing window frames in a tunnel along the High Line. Finch travelled the Hudson River on a tugboat and photographed the river once per minute for 700 minutes. A single pixel from each image provided the color for each pane, which is arranged chronologically to document the journey.